We’re ushering in yet another Monday with this weeks free colouring sheet! I know you’ll love my fancy face. I made you a new colouring sheet! Enjoy! Here is a picture for you! It’s also a colouring sheet. I watched Death Note and it was pretty rad, so this happened. We’re still fans of horror, but we’re taking a ride down the tunnel of weird (you probably noticed). We still firmly believe that anything can be horror, but that depends on the person being horrified. A lot of things are weird, however, and they’re here to stay–from the amoeba to the hairs on your toes. Over the two years or so The Enigmatic Monster Project has been evolving into a weird fiction blog. We’ve finally admitted that to ourselves. And obviously that equals a colouring sheet/pretty picture . . .
Again, I apologize for the general lack of posts. I’m still doing that life thing: apply for jobs, do freelance, apply for unemployment. The H&M recruitment site is very well designed, to be a little off topic. Anything that allows you to use your Linkedin profile gets an A in my books. Rather than drool over the fantastic user experience . . .
Maybe it’s because of the trace toxic chemicals that are still present in the soil, or maybe it’s Maybelline? On a side note, I would just like to mention that I have produced some quality material for EMP; a lot of it needs to be typed up. I find that writing things down goes a lot quicker. Call me the Word Wizard for now, I guess. Emperor is also acceptable . . .
Nah, it’s definitely the dihydrogen monoxide! I like how you pray. I heard you five dimension over! A little update here: it’s P. L. Cobb, and I’m just letting everyone who follows the blog know that things are getting super busy now. I have other projects that I’ll need to focus my attention on. The blog will still be updated, but it’ll be updated once or twice a day, with a blitz thrown in here and there for good measure. In the meantime, enjoy some graffiti made by some donkus* in Sault Ste. Misery. *We say the word with some affection in this context, mainly because this is some decent work compared to our usual fare. No, this is not Dismaland. We say this with a heavy heart. Sault Ste. Misery is located in Ontario, the Canadian province. A big body of water separates us from the UK. Tell Banksy to come here for a visit; no one will notice him, and no one will care about him. All is apathy in Sault Ste. Misery! I wonder who’s home? What do you think? Resident priest, or something else? Gee wiz! It’s the stairway to nowhere! That’s right folks, only in Sault Ste. Misery! No one’s climbing up and no ones coming down tonight. Or ever. Or at all (just thought we’d throw that out there)! Rising from the depths clutching a bottle of liquor in one hand, a brush pen in the other and a sketch book between my teeth, it’s everybody’s favourite, loveable the other co-host of the IMPcast, Jon. I figured since I brought it up on the latest podcast again, I thought everybody ought to get a nice sample of how messed up Kentaro Miura, artist and writer of BERSERK, really is. Unfortunately for this blog, even I know what’s too far to post. So I had to find tame images that were able to showcase how unnerving, disturbing and gruesome the story can get. I think you can tell how…difficult that is, given the parameters I’ve just described. And of course by difficult I meant INFURIATING. Anyways, I managed to find four. 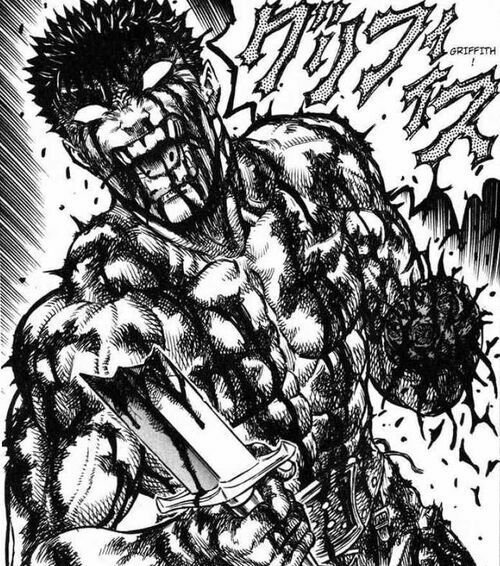 Out of a manga with 37 volumes, 3 movies and an anime adaptation of the first arc of the story thats been going as long as I’ve been alive (correction: BERSERK is a year older that me), I found 3 images of monsters and 1 of the main character (Guts) that were suitable for posting here. Here’s one of Nosfaratu Zodd, where he forgot to shave. Next is a group of cooky goofballs who just love to pal around. Another one that showcases how much Kentaro Miura’s love for eyes and mouths. Boy, does this guy love eyes and mouths. A lot. Finally, here’s one picture of the main hero, taken from a random point in the story with no context. Say hi to Guts, everybody. He’s a happy guy. And with that, is my small sample of BERSERK for you people. And that was no where near the level of insanity it gets up to. Though it’s not all blood, guts and monsters. It’s also about morality, love, existence and the importance of friendship and reaching your goals. Those ideas just happen to covered in bloody monster guts. Gotta love it! A very monstrous find, one finds the illustrated tome of The Resurrectionist quite appealing. For one, it’s a two part book, opening with a pseudo-biographical look at a most ingenious yet delusional scientist by the name of Dr. Spencer Black. Second, it is lovingly illustrated with exquisite diagrams of mythical creatures brought to life as various formes of human evolution in a collection called The Codex Extinct Animalia — and this, my friends, is where the juiciest tidbits are found. Some of the creatures covered in the Codex include the Sphinx, Siren, Satyr, Chimæra, Pegasus, Oriental Dragon, and more. Finding a copy on-line at Chapters.Indigo, I was ecstatic to receive it in my post a few weeks later. I highly recommend a copy to anyone with a love of the bizarre, and the mythical. How many double-sided sketches does it take to nail a design for images for ABCs of Horror, our upcoming project? Well, for one artist…quite a few, actually. And lots and lots of notes. But with a little luck, determination and obsessive self-critique, the designs were eventually nailed down for six of the twenty six images to be included in ABCs of Horror. We at EM apologize for the low quality images of these rough sketches and remind you to please, keep it monstrous. You’re not allowed to park in front of it, but you can still stand in front of it. And you can still look. You can even touch it if you want . . . Sometimes I wonder if there are very specific signs designed with instigators in mind. If not, then there should. I just thought of something: what if the look person is giving Geocachers hints. Does anyone in Sault Ste. Marie know if there are any caches by the Bushplane Museum? And now it’s not. If you are newer to the Sault (or a just passing through), this building used to be part of the old St. Mary’s paper mill.